Fernand Deligny, The Arachnean and Other Texts, Trans. by Drew S. Burk and Catherine Porter, Minnesota UP, 2013. FERNAND DELIGNY found many ways of describing himself: primordial communist, nonviolent guerrilla, weaver of networks, cartographer of wandering lines. A visionary but marginalized figure often associated with the alternative and anti-psychiatry movements that emerged in the decades after World War II, Deligny (1913–1996) remains difficult to categorize — an enigmatic sage. Beginning in the 1950s, Deligny conducted a series of collectively run residential programs — he called them “attempts” (or tentatives, in French) — for children and adolescents with autism and other disabilities who would have otherwise spent their lives institutionalized in state-run psychiatric asylums. After settling outside of Monoblet in the shadow of the Cévennes Mountains in southern France, Deligny and his collaborators developed novel methods for living and working with young people determined to be “outside of speech” (hors de parole). Despite the extensive body of writing published during his lifetime, Deligny’s contributions were largely ignored for several decades. (His posthumous obscurity has been, in part, of his own making: he increasingly withdrew from established channels of intellectual production and public exchange in his later years.) The 2007 French publication of Deligny’s selected Oeuvres sparked renewed scholarly interest in his ideas within a variety of academic disciplines, but these conversations tended to be confined to academic specialists. Now, with the release this year of The Arachnean and Other Texts, a translation of 16 short essays dating from the late 1970s, the small but industrious Univocal press has offered a wider English-language readership the chance to encounter Deligny’s strange and affecting work for the first time. Translated by Drew Burk and Catherine Porter, The Arachnean and Other Texts is not an easy read. Deligny’s prose is elliptical, fragmentary, and often mystifying. His writerly voice is hard to locate genre-wise, skirting between philosophy and poetry, anthropological observation and quasi-prophetic (if emphatically secular) aphorism. Deligny seems to have approached the practice of writing with the same spirit of open-ended, improvisatory experimentation that characterized his various attempts at radically anti-institutional communal living. Conducting research at his archives in France last summer, I was confronted by intimidating stacks of butcher paper covered with Deligny’s tiny, barely legible pencil scrawls — almost all of it unpublished, and probably still unread. Yet patient readers will find this book shimmering with quiet revelations. In place of orderly, coherent interpretive systems, Deligny attunes his reader to the lower frequencies of a life lived on the margins. His essays evoke the austere desert terrain of the Cévennes Mountains where he and his collaborators spent much of their time living in relative isolation; his deeply impressionistic writing surveys this landscape for its minor stirrings, and strives to imagine new arrangements of common life. Deligny was born to a middle-class military family in 1913. He studied psychology and philosophy at the University of Lille before securing a position as a special education instructor for children and adolescents at a psychiatric asylum at Armentières in 1938. He joined the French resistance to German occupation during the war, and continued to pursue his educational work with mentally disabled children while stationed in Lille. In 1948, with the financial support of the prominent educational theorist Henri Wallon, he founded La Grande Cordée (The Great Cord), a collectively run, loosely organized group of educators and psychiatrists seeking to develop an alternative to the bureaucratic and frequently abusive state-run psychiatric and juvenile delinquent systems. (In his recent joint biography of Gilles Deleuze and Félix Guattari, François Dosse describes La Grande Cordée as “the first experiment in outpatient treatment designed to keep adolescent delinquents out of psychiatric hospitals.”) Its initial headquarters was located in an abandoned Parisian theater, which Deligny transformed into a kind of ad hoc youth drop-in center. Accordingly, Deligny developed an understanding of autism that was far different than the predominant psychiatric models of his era, especially those influenced by rigidified and institutionalized versions of psychoanalysis. For him, autism was a mode of being, like any other — but one whose true qualities had been obscured by a rapidly proliferating series of political and scientific discourses that, in turn, had led to stigmatizing and frequently harmful forms of treatment, surveillance, and social control. Indeed, psychoanalysis has had a generally abysmal track record when it comes to autism — one need only think of Bruno Bettelheim’s pseudo-Freudian theories, popularized in the 1960s, blaming the condition on emotionally remote “refrigerator mothers.” Deligny rejected the dominant understanding of autism as a condition that “entrapped” children and rendered them incapable of forming emotional attachments to others. The real: it seems to me that I have come across this word in texts written in the French language, no doubt about that, but owing to the fact that that language is double and at the very least has double meanings, goes in two directions, it swept the words away from under my nose, and then, now you see them now you don’t, who knows what became of them in that waltz whose music I don’t perceive. It is completely discouraging to hold a word in sight, and see it spin around, pair with others, join a constellation, like a string of beads; in fact it escapes you like a ball on a playground; others play with it cheerfully, but what are they playing at, what’s their game? It’s a mystery. The way in which Deligny breaks down language into its constituent phonetic components can make his peculiar prose difficult to follow, especially when encountered in translation. But the cumulative effect of this semantic playfulness also makes for a mesmerizing read, as if he were using the blockiness of language against itself in order to chip away at the ideological sedimentation that has accrued around verbal concepts usually taken for granted — above all, that of the “human” itself. “The human-that-we-are is the product of a long process of domestication,” he writes. Working with children and adolescents without easy or transparent access to verbal speech requires the momentary suspension of interpretation, so that something else — the flicker of a gesture, “the remainder, resistant to any comprehension” — might begin to come in to focus. Abandoning the politically charged atmosphere of La Borde for the desolate Cévennes region, Deligny and his colleagues continued their singular pursuit of “the network as a mode of being” — one that would be far less concerned with interpreting behavior and experience according to the hidden intentions and secret desires of individual human subjects, and more focused on “tracing” the trajectories, detours, and wander lines that compose a given social milieu. 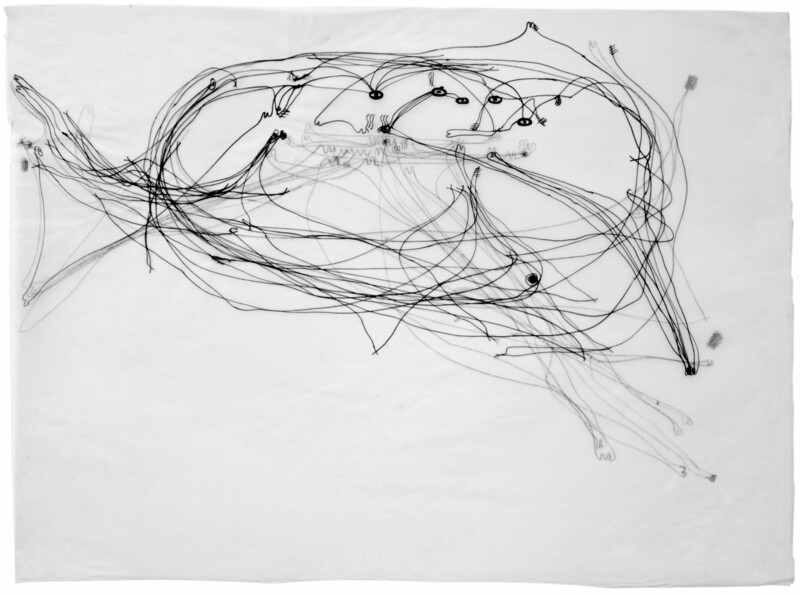 It was here that Deligny consummated his longstanding preoccupation with mapping the gestures, movements, and trajectories of the autistics living within his networks. He first experimented with cartographic tracing in the late-1960s in collaboration with a young militant filmmaker, Jacques Lin, who joined the group’s small desert encampment. Deligny, Lin, and their collaborators began to follow their autistic counterparts as they made their way through the Cévennes’s rocky terrain, making rudimentary line drawings to indicate their direction of movement across the rural encampment and into surrounding wilderness. The tracings soon became a central aspect of the group’s activities, and the maps grew steadily more detailed and elaborate. They developed visual systems for designating the various sounds and gestures encountered along their pathways, and started to use transparent wax paper to trace the children’s daily routes. No attempt was made to interfere with their movements, or to explain or interpret them. The focus remained on the process of tracing itself. Yet distinct patterns began to emerge: certain trajectories tended to be repeated from one day to the next, and Deligny noted that some of the wandering lines seem to correspond to the conduits of underground waterways. In his writings, he calls these cartographic trajectories lignes d’erre. This phrase might be translated as “wander lines,” “errant lines,” or “lines of drift” (Burk and Porter tend to go with the first option). The concept of the wander line is the most significant and original contribution of Deligny’s thought: it condenses, in a single stroke, his lifelong pursuit of “draining off stagnant humanisms” by unsettling the primacy of speech. He undertook the process of mapping the lines “in order to make something other than a sign.” Before phrases, words, and letters can form, there must first be lines. Tracing the quotidian trajectories of his autistic collaborators, it seems, was an attempt to return to writing’s origins, before it became codified or standardized, and when it still resembled the outlines of things encountered in moving through the world. There is another word that Deligny often uses in relationship to mapping the wander lines: vaguer, a verb that shares a root with the French noun for “wave.” (Burk and Porter alternate between translating this word as “wandering” and “drifting.”) Like the French word vague, drift carries with it a sense of the movement of water, as in drifting down a river (a figuration that also recalls Deligny’s comparison of his group’s provisional encampments to rafts afloat on a sea of language). Indeed, Deligny’s language continuously evokes a kind of bodily letting go — an attenuation of subjective agency and conscious intentionality, as when one surrenders to a powerful ocean current. This quality is central to what Deligny is trying to evoke with the lignes d’erre, which seem to register an epistemological slackening of the distinction between the human subject and the nonhuman forces it encounters in a given environment. “The fact that drifting has no predefined object can make one think that the subject, then, is adrift,” he writes. He insists that this is a profound error of attribution, with dire consequences: the notion of the language-grounded human subject — and what he calls its “thought-out-project” — has been a regulative norm that conditions one’s access to social existence. In place of depth-based models of human subjectivity, Deligny offers cartographic surfaces and the hand-drawn lines. The Arachnean and Other Texts includes photographs of the residents of Deligny’s rural encampment, taken in the summer of 1969, as well as over a dozen black-and-white reproductions of a selection of the wander-line maps, dating from the late 1970s. A few include detailed captions describing the trajectories and symbols of the various lines — one, from 1976, indicates not only the trajectory of a particular child, Ann, and an adult, Jean Lin, who traced her movements, but also shows the places where they encountered a flock of sheep (and heard the ringing of sheep bells) and stopped to cut wood for the encampment. Others are less detailed but more graphically arresting: the lines loop and tangle to form distinctive shapes, hinting at habits of movement and direction that become visible over days, weeks, and months of tracing. Starting in the early 1960s, Deligny and his group began filming the daily activities of their encampments; it is especially illuminating to consider The Arachnean and Other Texts alongside Deligny’s cinematic work (a three-disk DVD set of his films was released in France in 2007). Deligny’s interest in the pedagogical uses of film can be traced to his early friendship with André Bazin and Chris Marker. (In the years following the war, all three worked at Travail et Culture, an organization affiliated with the French Communist Party whose mission was to offer educational and cultural activities for proletarian factory workers; it soon became an intellectual and cultural incubator for the postwar French Left.) Under their influence, and in line with emerging ideas about the political potentials of renegade or amateur filmmaking and the rise of the “Third Cinema” movement, Deligny believed that the tools of filmmaking could be especially liberating for young people for whom the conventions of written or spoken language functioned as an impediment to social integration. Through his friendship with Bazin, Deligny also formed an important connection with the young François Truffaut. The two consulted as Truffaut was in the process of making his 1959 debut feature, Les 400 coups (The 400 Blows). According to their correspondence, Deligny was especially influential upon Truffaut’s construction of the film’s iconic final sequence, in which Truffaut’s protagonist and autobiographical counterpart Antoine Doinel escapes from the rural institution for social delinquents where he has been confined, and is shown running across the countryside into the churning waves of the ocean. If the New Wave filmmakers that Bazin helped to foster approached cinema as its own expressive language, Deligny and his collaborators viewed it a powerful alternative method for registering the gestures, wanderings, and other repertoires of bodily movement that unfurled beyond the reach of semantic coding and language-based systems of interpretation. A feature-length, quasi-narrative film created out of this footage was shown to acclaim (and considerable bafflement) at the Cannes Film Festival in 1971, under the title Le moindre geste — The Slightest Gesture. Transposed into a cinematic idiom, the wandering lines that Deligny traced along the transparent surface of hand-drawn maps become slow tracking shots of solitary figures wandering through barren landscapes and the ruined edifices of primordial structures. The film stages a refusal of the psychological conventions of cinematic identification, and what Deleuze and Guattari termed the “archeological conception of psychoanalysis,” with its reliance on the interior, hidden depth of the unconscious. In The Smallest Gesture, the wandering line becomes akin to a reel of film, linking Deligny’s cartographic practice to the possibility of escaping from the disciplinary regulation of the body within institutions, clinics, and asylums. In recent years, the radical critiques of psychiatry that emerged in tandem with the new social movements of the 1960s and ’70s — which were so central to a range of feminist, gay liberation, and anti-colonial struggles that took shape in those decades — have largely faded from view, even as the reach of psychiatric power has become ever more pervasive and molecular in scope. Encountering Deligny’s writing today reveals the richness and vitality of this critical heritage, and serves as a much-needed reminder of its ongoing relevance. In view of his stringent critiques of psychiatric authority’s coercive and normative force, it is worth considering how Deligny’s work might illuminate more contemporary struggles over the politics of mental health. Yet the essays collected in The Arachnean and Other Texts consistently attest to Deligny’s profound uneasiness in affiliating with any stable or pre-existing political position. Ogilvie compares the paradoxical motivation that underlies all of Deligny’s writing to a question posed, in a slightly different register, in the work of Georges Bataille: “How to form the project of exiting from all projects”? Or, as Deligny himself asks in a still-untranslated essay, how to imagine a mode of relation that would be “outside of function” — one that would not bear the traces of a desire to make autistics and others who live outside, or on the margins, of language conform to the shape of the “thought-out-project,” the neurotypical subject, the human-that-we-are? Fernand Deligny, Maps And Wander Lines, Sandra Alvarez De Toledo Ed., L'arachneen, 2013. In 1968, Fernand Deligny created a network for autistic children at Monoblet, in the Cévennes region of France. Social workers were asked to transcribe the children’s movements and gestures, and for ten years, they traced maps of their own journeys and then, on tracing paper, the children’s “wander lines” were marked, circulating within these territories and gravitating towards activities, presences, objects, or nodes of life. Organised chronologically and by living area, this rather inscrutable book assembles nearly 200 maps of a world existing outside of language. Arranged like a notebook, the maps and their descriptions, based on interviews with their authors, are shown together. These are diagrams created by autistics in conjunction with Fernand Deligny, who ran a series of encampments for autistics in Monoblet France from the mid-sixties to the late nineties. These were done over 20 years on tracing paper and were created out of a desire to diagram the experience of movement. The autistics were mute (as many are) and so the drawings became a kind of language in movement that served less to demonstrate their movements than to activate a thought in movement. Over the years, building on this explicit mandate to invent modes of relation that do not necessarily rely on words, a singular iteration of experience in the making begins to take the form of maps of movement, tracings, as Deligny calls them. These tracings, a collaboration between the network and the autists, become incipient cartographies of an associated milieu of relation that builds on the way movement and life-living interrelate. The challenge, as Deligny conceived it, was to learn “to see language from the point of view of a mute child,” (Toledo 2007: 679). A choreographic proposition. A cartography is suggested today by Deligny when he follows the course of autistic children […] All these lines are tangled. Deligny produces a geo-analysis, an analysis of lines which takes his path far from psychoanalysis, and which relates not only to autistic children, but to all children, to all adults (watch someone walking down the street and see what little inventions he introduces into it, if he is not too caught up in his rigid segmentarity, what little inventions he puts there), and not only their walk, but their gestures, their affects, their language, their style” (2007: 128 my emphasis). Jean Oury remembers Deligny’s frustrations with the language of psychoanalysis while still at La Borde, particularly in any encounter where patients’ dossiers are foregrounded. For Deligny, what seems to be more important is the lived experience of co-existence, not how the patient has been evaluated in an institutional framework. “What matters, he would say, is the project. We could care less about thought” (Jean Oury, quoted in Toledo 2007: 638). Whether or not the tracings were actually drawn-into by the autistics is not clear. “About the tracings – which he calls act-signs – we do not always know whether they concern the adults or the children. The border is mobile” (Toledo 2007: 644). And yet, the tracings are absolutely a collaborative enterprise, a drawing-with of emergent spacetimes of recomposition. The traces, and especially what Deligny calls the “lines of drift” (lignes d’erres) allow the territory to “become seen,” they map into it its resonance as more-than a pre-existent territorial enclosure. The tracings are a way of learning not to speak “about” autistics in their presence as though they had no language, or as though their experience didn’t count. This would only feed the already ingrained institutional habits Deligny wanted to usurp. But something had to be made of the experience – these were the tracings, the creation of a movement-with that could lead the group to see anew. Sandra Alvarez de Toledo speaks of “machines for seeing,” a modality of seeing that does not return to the eyes themselves [le regard] or language. The tracings “made seen the forms of the human absent from the image of man” (2007: 799). Isaac Joseph writes, “the maps were an attenuated and aestheticized echo of the work in the presence of the children,” a project to teach the adults how to see the autistics’ lines of drift, “how to see a common territory without subject or language, to see-with-it (s’Y voir), despite themselves” (in Toledo 2007: 684). In Deleuze and Guattari’s A Thousand Plateaus, Brian Massumi translates “lignes d’erre” as “lines of drift.” In Dialogues, translated the same year by Hugh Tomlinson and Barbara Habberjam as “lines of wandering.” I’ve re-translated them here as “lines of drift” to keep the text consistent. Though “erre” does have the sense of wandering, I like the sense of drift as not being necessarily activated by the human, but also in the environment, in a movement-with of emergent spacetimes. Fernand Deligny was a filmmaker, writer, activist, and educator whose work drew interest from prominent thinkers such as Gilles Deleuze, Félix Guattari, and Michel de Certeau. His writings on networks as a mode of being are now coming to the forefront in academic fields.